Golden Apples: Are they socks yet? No—but soon, very soon! 7 inches of the leg have been knit, in another few rounds, a heel, and then zoom! The second half of the sock is always faster. 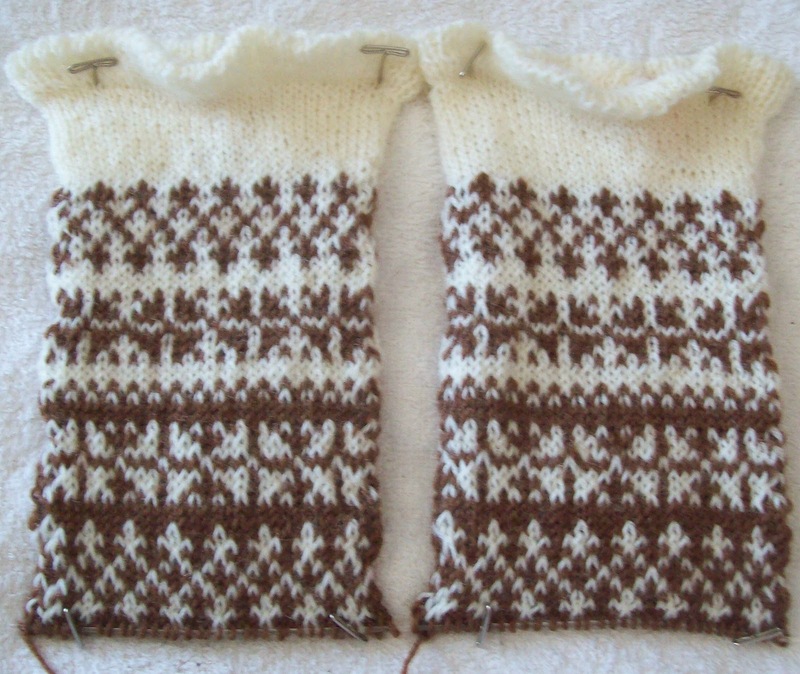 And besides, there will be an echo of the color work at the toe-a bonus to look forward too. These socks bring me back to my first love (in knitting)--simple patterning, in 2 colors, in the round. I first taught myself to do stranded work in 1961—because I LOVED how it looked. And 50 plus years later, I still love it. I love too, how knitting has so many options. I know knitters who love lace—and knit lace almost to the exclusion of everything else. Other knitters love cables, and work the most intricate sweaters. There are so many things to love about knitting, there is something for everyones taste, everyones desire. These socks are so much better than my first attempt at stranded work. In my first attempt, I was ignorant about repeats (and didn't have the right count) and ignorant about centering and didn't have the pattern centered in front. I didn't care—well, I didn't care enough to rip it out and frog it. And my doll? (I was knitting doll clothes) didn't mind in the least either. And these fit so much better than my first pair of stranded work socks—which didn't fit at all! My fingers have some pain, too (and shoulders, and ) but none of this will stop me from doing some more work today. 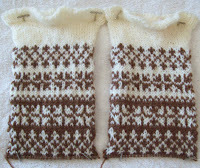 Likely, by this time tomorrow, there will be a flap, a turn and portion of a gusset knit. Most of the knitting got done last night.. yesterday I made sure to get out and get in a brisk walk—a doublely brisk walk—half the way the wind was pushing me along, the second half, it was fighting me. But it was a glorious sunny day—and it felt perfect for March! The weather has been lovely (I really can't complain)but it was like May, not March--and there is something special about March winds, isn't there? Plus-- I got a bonus load of wash done—all my summer/canvas shoes. I normal try to get them washed at the end of the season—but I went and got sick back in October, and never got around to it. I have been likened to Imelda Marcos--(not quite as bad, but..) and had 9 pair of shoes for the wash--(some are over 10 years old)--when you have a lot of shoes and sneakers, and rotate them, any single pair might only be worn a dozen times in a summer—and half the wear of the canvas tops comes from the agitation of washing them! So they last—usually. I am always disappointed when they don't. And I end up with a full range of colors, too! It's still early in the season—and some of the shoes don't fit with socks—so they are super summer time wear—but its nice to be ready for summer. Those stranded color socks are stunning.